SACRAMENTO – “President Trump may dial up his efforts to mislead the American people into believing climate change is a hoax created by the Chinese, but we Californians laugh at such lunacy because we know — without doubt or reservation — that the fate of the planet is at stake. Building critical public infrastructure and a future that does not depend on fossil fuels is now deadly serious business,” Treasurer John Chiang said to a gathering of policymakers and top-level executives at the Milken Institute California Policy Summit in Sacramento today. While speaking with attendees, Chiang signed the “Green Bond Pledge.” A declaration with broad and far-reaching impact, states and cities across the nation are being urged to take the pledge that would commit them to a strategy that will finance infrastructure and capital projects that meet the challenges of climate change with “green bonds,” or green financing. “Treasurer Chiang is taking smart action to strengthen the market for climate-friendly bonds,” said California Governor Edmund G. Brown Jr., who is hosting the Global Climate Action Summit in San Francisco in mid-September. The summit will showcase actions — including the Green Bond Pledge — states and regions, cities, companies, investors, and individual citizens are taking to realize the goals of the historic 2015 Paris Agreement. Those signing the green bond pledge agree that climate change poses an existential threat and that the rapid growth of a green bonds market will not only meet the unique challenges the world faces, but will do so while making communities more economically competitive, prosperous, and productive. Next, the governor and treasurer are establishing a working group to develop and implement a green bonds strategy to fulfill the commitments outlined in the Green Bond Pledge. Green bonds may be sold by governments, as well as by private entities, to finance projects that have positive environmental or climate attributes. The projects can range from clean transportation to renewable energy. The American Society of Civil Engineers estimates the U.S. currently has a multi-trillion dollar shortfall in funding its infrastructure needs in the coming decades. In California alone, independent reports estimate the shortfall will exceed $400 billion over the next 10 years. The green bond market started in 2007 with bonds issued by the World Bank and the European Investment Bank. By 2017, both California and New York had issued more than $4 billion in bonds to finance such things as clean water projects, green schools, mass transit, land preservation, and green housing. The state is now looking to build on that start and help grow a much more robust market for green bond financing. The Green Bond Pledge aims to help establish the market and accelerate its growth. The pledge was developed and designed by international climate finance and environmental groups. Treasurer Chiang has devoted considerable energy and time to unlocking the potential of the green bond market. His office has handled more than $2.2 billion in green bonds for mass transit, clean water, and pollution control projects, as well as for Kaiser Hospital green buildings, and a rice-straw fiberboard plant. The treasurer’s senior team will also be discussing green bonds with Chinese provincial government officials in the fall. In 2016, Treasurer Chiang conducted a five-city, national listening tour, meeting with market experts and investors to identify barriers and challenges to growing the green finance market. In February 2018, he convened a green bond symposium with the Milken Institute and tasked its blue-ribbon Financial Innovations Lab® with developing actionable paths to creating a more robust green bonds market. The result was two ground-breaking studies. The first, issued in 2017, identified the barriers and challenges to growing the green bond market. The second was unveiled today. 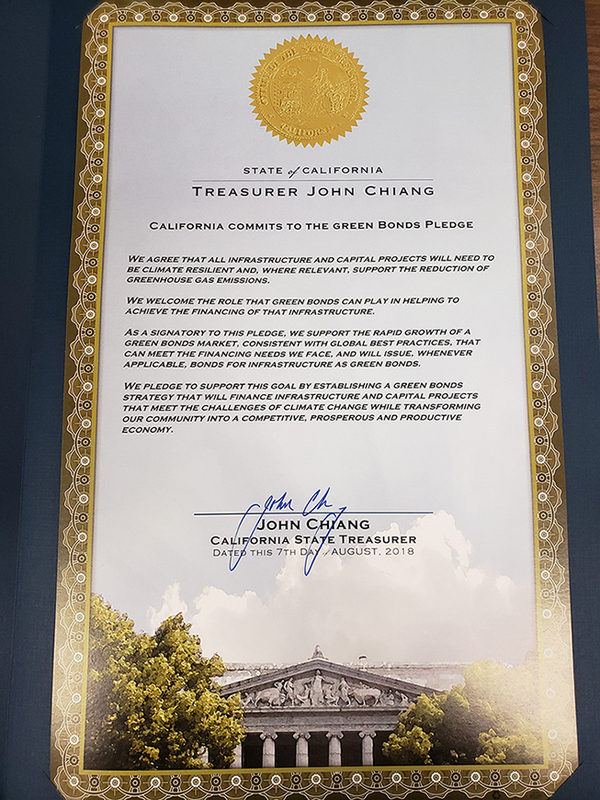 A copy of the Green Bonds Pledge can be found here and a signed copy of the pledge by Treasurer Chiang can be found here.